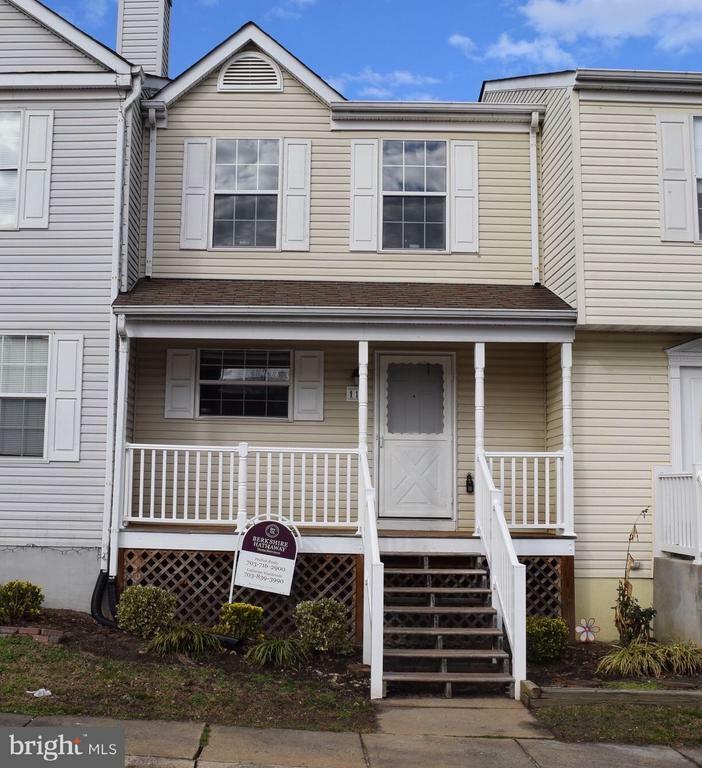 Nicely updated town home close to commuter lots, shopping centers and commuter routes. Kitchen expanded to offer more storage and family space. Granite counters, stainless steel appliances and new flooring in the kitchen is awaiting you. Breakfast peninsula with great lighting and new wood flooring flows into a large living room. New sliding glass door onto your private deck and fenced yard. Bathrooms have been upgraded and have designer touches. New energy efficient lighting and dimmers will keep those energy costs down. Large rec room in basement with full bath for extra living space for your visitors. Sit on your covered front porch on those beautiful days and then take a short walk to multiple restaurants and the shopping center. The commuter lot is a quick walk as well. 2 parking spots and many visitors spots make entertaining easy.. Seller will to pay a FULL YEARS HOA/CONDO fees with suitable offer! Fees cover all exterior maintenance including front flower beds! Just come home and relax. Debbie helped my elderly parents sell their home of 30+ years. It was hard for them, and she was patient and wonderful, and she went above and beyond with helping us get the house ready to market. Every recommendation she made about the home's appeal was spot-on. Thanks, Debbie! We love Debbie! She was extremely helpful and knowledgeable about selling our home. I would highly recommend her to help you find a new home. © 2019 BRIGHT, All Rights Reserved. Information deemed reliable but not guaranteed. The data relating to real estate for sale on this website appears in part through the BRIGHT Internet Data Exchange program, a voluntary cooperative exchange of property listing data between licensed real estate brokerage firms in which Price, Rich & Associates CENTURY 21 New Millennium participates, and is provided by BRIGHT through a licensing agreement. Real estate listings held by brokerage firms other than Price, Rich & Associates CENTURY 21 New Millennium are marked with the IDX logo and detailed information about each listing includes the name of the listing broker. The information provided by this website is for the personal, non-commercial use of consumers and may not be used for any purpose other than to identify prospective properties consumers may be interested in purchasing. Some properties which appear for sale on this website may no longer be available because they are under contract, have Closed or are no longer being offered for sale. Some real estate firms do not participate in IDX and their listings do not appear on this website. Some properties listed with participating firms do not appear on this website at the request of the seller. Data last updated on 2018-05-30.